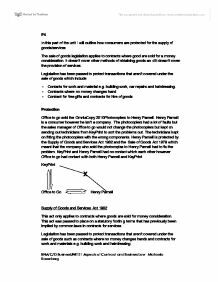 The sale of goods legislation applies to contracts where good are sold for a money consideration. It doesn’t cover other methods of obtaining goods and it doesn’t cover the provision of services. Contacts for work and material e.g. building work, car repairs and hairdressing. This act only applies to contracts where goods are sold for money consideration. This act was passed to place on a statutory footing terms that has previously been implied by common laws in contracts for services. Legislation has been passed to protect transactions that aren’t covered under the sale of goods such as contracts where no money changes hands and contracts for work and materials e.g. building work and hairdressing. This means the trader providing the service has a duty of care to you and your property, and should complete the job in good time and at a reasonable cost, even if you didn't agree a deadline for completion or a final price in advance. If the service is not in accordance with these standards, you are entitled to get a full or partial refund, replacement or repair. Consumers are protected in contracts for the supply of goods/services by sections 13 of the Supply of Goods and Services Act 1982. This is an implied term about care and skill. The consumer is protected by this act as it’s an implied skill that the supplier of the goods has to carry out the service with reasonable skill and care otherwise the photocopiers that the suppliers are supplying could break. As there is no direct contact between KeyPrint and Henry Parnell, Office go to had to deal with the problems of the faulty OmniaCopy 2010Photocopiers that they sold to Henry Parnell. However as KeyPrint had sold the Photocopiers to Office to go they had to help them deal with these problems. KeyPrint send technicians to try and solve the problems however the problems were not sold which may have led to Henry Parnell suing Office to go as the goods were not fit for purpose. 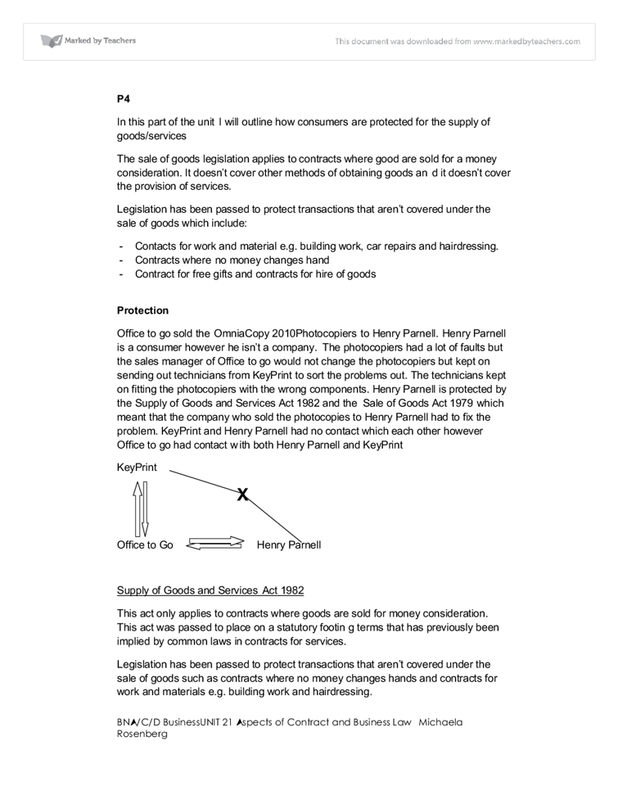 Section 14 and 15 of Sale of Goods Act 1979 state how the consumers are protected by goods and services that they purchase from a supplier. Where the seller sells the photocopiers, there is an implied term that the goods supplied under the contract are of satisfactory quality. Goods are of satisfactory quality if they meet the standard that a reasonable person would regard as satisfactory, taking account of the description of the goods and all the other relevant things related to the goods. As the goods were not fit for purpose Henry Parnell had the right to return the photocopiers to Office to go. Furthermore, the individual's overall organizational skills are pre-determined by the processes undertaken. : Matrix organization This organizational type assigns each worker two bosses in two different hierarchies. One hierarchy is "functional" and assures that each type of expert in the organization is well-trained, and measured by a boss who is super-expert in the same field. Control determines employment contracts by contemplating such matters as to what extent does the individual concerned work under the direction of the employer. Who sets the hours of work, whether instructions are received on a day-to-day basis and whether the individual is required to wear a uniform. For example, the costs of disposing of plastics is very high, and it can produce a lot of harmful gas (Baillie, 2004).The best way is to recycle it. Second, it can reduce the carbon emission. As we all know the CO2 is the main cause of greenhouse effect. ?Customer service is about going the extra mile. Or as far as is necessary to achieve the stellar standards of customer service for which shops like Brown Thomas are famous. All their customer-service teams have excellent people skills, are great communicators and are gracious under fire.